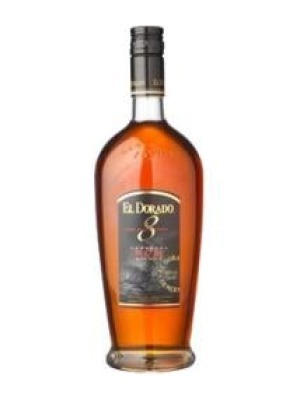 El Dorado 8 Year Old Rum is a popular Rum available from DrinkSupermarket.com in 70cl to buy online. Visit DrinkSupermarket.com for the best price for 70cl of El Dorado 8 Year Old Rum or compare prices on our other Rum products. This 8 Year Old rum is a intricate fusion of a full flavoured rum with light-to-soft sipping rum which can also form the basis of memorable cocktails. On the nose traces of tobacco fused with toffee toffee. Faint fragrance of dried stone fruits and flambee banana. Soft and faintly sweet mouth-feel with traces of oak and butterscotch. Where to buy El Dorado 8 Year Old Rum ? El Dorado 8 Year Old Rum Supermarkets & Stockists. You can buy El Dorado 8 Year Old Rum online in most retailers and find it in the Rum aisle in supermarkets but we found the best deals online for El Dorado 8 Year Old Rum in DrinkSupermarket.com, TheDrinkShop, Amazon.co.uk, and others. Compare the current price of El Dorado 8 Year Old Rum in 70cl size in the table of offers below. Simply click on the button to order El Dorado 8 Year Old Rum online now.